Home > Sermons > Christmas > Does It Really Matter? 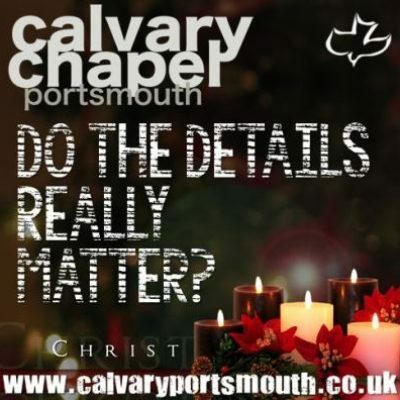 This teaching, entitled “Do the details really matter?”, was given as part of our family service on 17th December 2017 by Pastor Barry Forder. What is your tolerance for being off course? Are you ok with a one degree mistake? At first glance, it may seem like “no big deal,” but once you start to see the full possible impact of such an error, you’ll probably agree with me that even a one degree mistake is unacceptable. For every degree you fly off course, you will miss your target by 92 feet for every mile that you fly. For every 60 miles you fly, you will miss your target by one mile. Flying around the equator will land you almost 500 miles off target. Of course, you all recognise the absurdity of the above. In every walk of life we know the importance of sticking to the rules, following the instructions (have you ever tried to build flat-packed furniture and thought you knew better than the instructions??!!). Details do matter, and it is no different when we turn our thoughts to the Bible. It is not multiple choice! It is not ‘open to interpretation’, you cannot just make it say what you want to say to fit your particular view point. It is amazing, therefore, when we come to the ‘Christmas story’, that we find the Bible has been largely put to one side and Tradition has now become our teacher! We are told of 3 kings (we are even given their names! ), a star over a stable, a donkey, ‘oxen gathered around’, an inn-keeper and more – none of which are found in the Bible! The Devil tried so very hard to prevent the 1st Christmas. He failed. But he has gone to extraordinary lengths ever since to obfuscate what really happened. Spurgeon once said: discernment is not telling right from wrong. It’s telling right from almost right! Hopefully, our Christmas nativity play in 2017 (and this teaching) go some way to addressing the problem that tradition has caused and unveil the real truth of the Lamb that was born that night in Bethlehem. Why did the angels appear to shepherds? …and why those shepherds in particular? What was so important about them? Why didn’t the shepherds need directions – they were only given two signs, from which they knew exactly where to find Jesus!